It is I, Pathetic Blogger. You may call me PB. ... Seriously, I'M SORRY. Life. November. School. But it's (almost) CHRISTMAS, so, forgive me?? Remember, Remember -- I rounded up November; fangirled a bit. I Do Not Cry At Books (or, why last month was an exception to that rule). -- I reviewed my November reads. That is to say, I reviewed A Tale of Two Cities by Charles Dickens and Anne of the Island by LM Montgomery, and I had a fangirl meltdown RE Skulduggery Pleasant: The Dying of the Light by Derek Landy. ... I'm still not over that book. #16 // Blogging Friends -- I received two Liebster awards, and I went back through the 16 Liebsters I've had since I started blogging and looked at some of my blogging friendships and lamented the passing of inactive blogs! 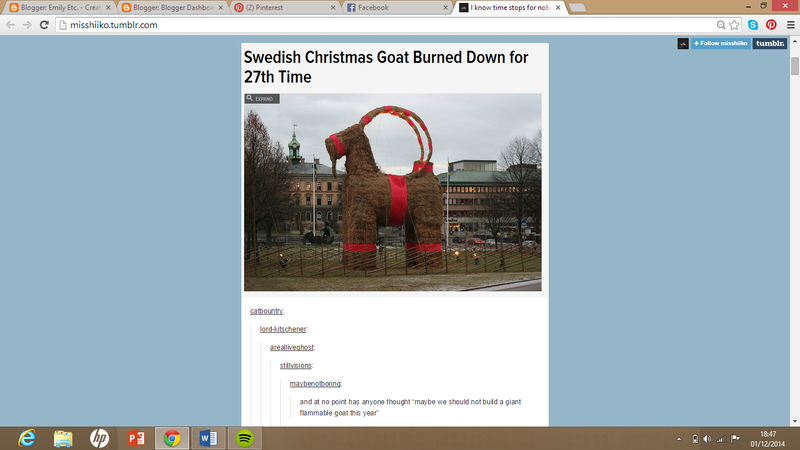 .... And that, pathetically enough, was the entirety of my posting. I know. I know. I know. ~ I wrote some of my novel! Yay! Not as much as I should have! But if I put exclamation marks after every sentence it'll seem like a positive anyway! So novel! Yay! ~ Music? THE WOMBATS ASKLFJAS;LKDFJALSDKJF. I'm seeing them live in April! HAPPY DANCE! ~ Other than that, I'm adoring this song. I'm not the biggest Florence fan but I absolutely love this. New favourite at the moment. ~ WHAT A FILM! The truth is I don't watch many films, and I very rarely go to the cinema. Why? Maybe I'm cynical, maybe I have a tiny attention span, but I worry that the film will be rubbish, but then I have like a complex about turning it off partway through and ~old lady voice~ films are so long these days, that I usually assume it won't be worth it. 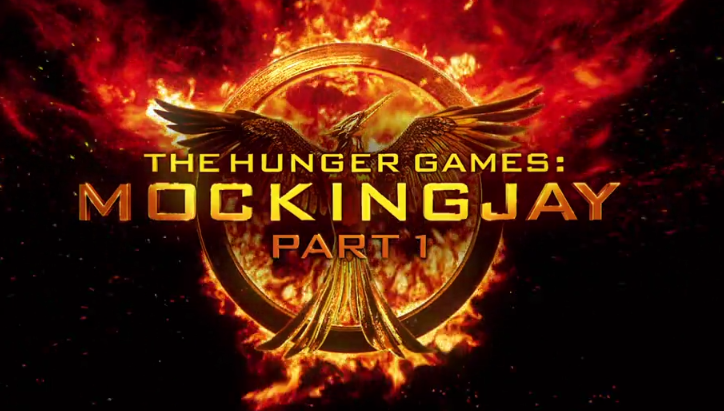 However, I went to see Mockingjay Part 1 because my friends were going, and I loved it! I really did not enjoy the third book, and I've also not seen Catching Fire and I've forgotten most of the plot (I read the books a long time ago, OK?) but it was great nonetheless! What did you think? Derek Landy (Skulduggery creator? Genius, feels-manipulating psychopath? One of my favourite authors? Yeah, that Derek.) did a post entitled How To Write Books Good, Part 1. Perfection. And Part 2, about characters. I love this man. A lot. Treskie @ Occasional Randomness made me almost-cry with her amazing pictures and a Tim McGraw song. Sunny @ A Splash of Ink wrote a hilarious and accurate post about blogging pet peeves. Charley R @ The Book Chewers shared some stories from working a bookshop. Reviews normally get their own post, but for the pathetic three books I read in November? I think not. Malte is a summer boarder in a tiny, straight-laced Norwegian town. He sees magic in the sea, friends in the wind, and lives more inside his own head than anywhere else. When a dead sailor's body in a coffin appears and rocks the small town's foundations, Malte is pulled into the mystery. I had no idea what to expect from this book. I went in thinking "well this could be really weird", and it was. Really, really weird. It was also beautiful - some absolutely stunning passages - and it had a good plot. It took a while to pick up, but I found myself quite caught up in the story and the characters. It had a certain depth, but on the other hand there was definitely something missing. As speculative fiction, it was very interesting and beautiful. As historical fiction? Less so. Overall, I enjoyed Prince's gorgeous writing, and I was pretty invested in the plot. But it took me longer than I would have liked, and was a little bit strange at points. 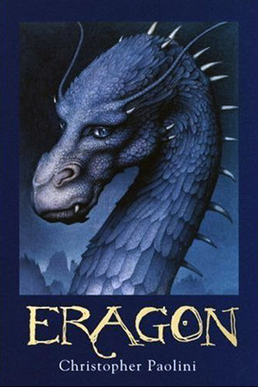 I had such high hopes for Eragon! Two different friends, one real-life, one bloggy, had told me it was good ... and it has a dragon on the cover! A dragon! Sad to say, they weren't fulfilled. Christopher Paolini really needed to see this. THE WRITING KILLED ME. There were enough adverbs to build a house. No one ever said anything - it was all grumbling and grunting and, yes, bantering. Bantering. As a verb of speech. And it was long, too. I like big books (and I cannot lie) but not when much of that length comes from pointless, overlong scenes. You know, and then they had their nutritious dinner and when they were totally full they lay quietly down in the shady clearing and fell quickly and dreamlessly asleep. The next morning they rubbed their eyes sleepily and continued with their lengthy journey -- like, we just don't need this. We just don't. OK, but, the plot was good! It was really good! It was pretty exciting, with twists. And Eragon did seem like quite a believable character, as did Murtagh. I wasn't sure about Arya. But I guess she'll get developed in later books ... ? Also, the magic was AWESOME! There was an ancient language and different sources of power and different types of magic, and stuff about the energy etc and it just made sense. It wasn't a group of random, incoherent spells. It was a discipline, with clear limits and laws. He'd obviously put a lot of thought into it, and it really worked. Overall, this book took too long and the adverbs hurt my soul. But I enjoyed it - great plot, awesome magic. Now, it's the age-old question of do I read the next one? Do I give this series another chance? I think I will, hopefully at a time when I can read it more quickly. Another book I had high hopes for. I finished Eragon thinking "and now for something subtle and well-written! 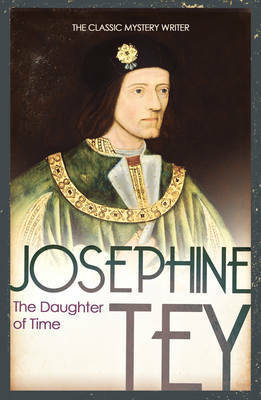 ", and I turned to Josephine Tey. I was a fan of Alan's character, and Brett was adorable. Also, the questions it raised about historical accuracy, about what we can trust and the sources we blindly take for granted, which I found very eye-opening. But I didn't feel riveted by Richard's story. It didn't sweep me up in a breathless historical whirlwind. It was very dry. Would I recommend it? For someone interested in history, yes. As a pageturning read? Nope. Aaand, that's all from me! It seems to be either feast or famine on this blog - I don't post and then I come back with something as long as the Mississippi (ie, this). But tell me: have you read any of these books? Give your thoughts! And link me up to your November round-up posts! Also, what was the best book you read last month? Hopefully you had a better time of it than me. PB...? As in Peanut Butter...? Thanks :L IT'S SO GOOD! Thanks for the shout out:) Reading your post made me want to reread Eragon. As soon as this semester's over, I'm going to be doing so much reading! You're welcome! Haha, really? Wow that's not something I'll ever be doing ... Have you read the whole series? Is it good?? SHOULD I READ BOOK 2???? I love The Wombats - I'm jealous that you get to go see them! I saw Mockingjay Part 1 as well and I was definitely impressed. I highly recommend you see Catching Fire! I'm so excited! Mockingjay was really good. I would love to see Catching Fire!